New Mapoon is 1 of the 5 communities that form the Northern Peninsula Area (NPA). The NPA consists of 1,030km2 in the northern most region of Cape York in far north Queensland. Injinoo, Umagico, Seisia and Bamaga communities make up the remainder of the NPA. New Mapoon is located near Bamaga, and was initially called Hidden Valley. The site was also locally known as Charcoal Burner or Mandingu. The government established New Mapoon to accommodate residents from Mapoon Mission, some of whom accepted an offer to relocate there following the closure of Mapoon Mission (Old Mapoon) in July 1963. Mapoon Mission was established under the name Batavia River Mission at Cullin Point in 1891 by the Presbyterian Church of Australia on the traditional lands of the Tjungundji people. Its residents included the Tjungundji, descendants of other local language groups whose lands were incorporated into the Mapoon reserve over time, people forcibly removed to the mission from the Gulf area and descendants of South Sea Islanders bought to the mission by Presbyterian missionaries. In 1954, the Presbyterian Church and Department of Native Affairs attended a conference at Mapoon to discuss the mission’s future. Director of Native Affairs, Cornelius O’Leary, rejected the Presbyterian Church’s proposal to maintain the mission and a policy decision was made to close the mission. Other problems at Mapoon had also been brought to his attention prior to the conference including financial and staffing difficulties, and resident dissatisfaction. O’Leary had already advised the government of his preference to close the mission before attending the conference. Residents of Mapoon were not consulted about the closure of Mapoon and most protested strongly against the initial plan to relocate residents to other Presbyterian missions or to ‘assimilate those ready for exemption [from the Protection Acts] into the Australian way of life elsewhere’. At the time the community became aware of the closure plan in 1954, around 285 people lived at Mapoon. The church administration did not commit to the government’s closure policy until 1960, after experiencing persistent pressure caused by under-funding and uncertainty after the discovery of bauxite deposits in the Mapoon-Weipa area in 1955. Between 1961 and 1962, the Presbyterian Church began deliberately reducing services to mission residents. The government had begun to build houses at New Mapoon. By July 1963, the last Presbyterian staff member had resigned, the Department of Native Affairs had appointed one of its staff as Superintendent of Mapoon and around 100 Mapoon residents had relocated to New Mapoon. At the end of 1962, around 162 people still remained at Mapoon continuing their campaign against the closure and setting up alternative schooling, food supplies and transport. The Queensland Government reported in May 1963 that the ‘balance of the inhabitants of Mapoon of their own volition moved to New Mapoon’. However, the official records indicate that this was not the case. On 14 November 1963, the Director of Native Affairs, Patrick Killoran, instructed the Thursday Island police to remove 23 people from Mapoon to Bamaga and ‘commence demolition of the vacated shanties on the reserve’. The next night, 2 Queensland police officers arrived at Mapoon on the MV Gelam, together with several Saibai Island Community Police officers. A police report of the event has never been located, however oral accounts and removal records confirm that all residents were removed and that some of the buildings and houses were burned at Mapoon at this time. The bulk of the demolition of the Mapoon mission occurred in mid-1964. Presbyterian Church records indicate that the remaining 70 residents at Mapoon were transported to Weipa and New Mapoon aboard the MV Gelam between January and May 1964. After the 1964 closure of Mapoon, former residents continued to lobby for the re-opening of their community. In 1974, Jerry and Ina Hudson and several other families returned to ‘old Mapoon’ and in 1984, established the Marpuna Aboriginal Corporation which gradually built up community facilities. On 30 March 1985, the New Mapoon community elected 5 councillors to constitute the New Mapoon Aboriginal Council established under the Community Services (Aborigines) Act 1984. The Act conferred local government type powers and responsibilities upon Aboriginal councils for the first time. Umagico, Seisia, Cowal Creek and Bamaga also elected council representatives at this time. On 27 October 1986, the New Mapoon council area, previously an Aboriginal reserve held by the Queensland Government, was transferred to the trusteeship of the New Mapoon Aboriginal Council under a Deed of Grant in Trust (DOGIT) lease. On 1 January 2005, the New Mapoon Aboriginal Council became the New Mapoon Aboriginal Shire Council. In 2007, the Local Government Reform Commission recommended that the 3 NPA Aboriginal councils and the 2 NPA Torres Strait Islander councils be abolished and a Northern Peninsula Area Regional Council be established in their place. The first Northern Peninsula Area Regional Council (NPARC) was elected on 15 March 2008 in elections conducted under the Local Government Act 1993. Mapoon Aboriginal Shire Council, Mapoon History (2011) <http://www.mapoon.com/37.html> at 5 November 2012. N Sharp, Footprints Along the Cape York Sandbeaches (Aboriginal Studies Press, Canberra; 1992) 12. G Wharton, The Day They Burned Mapoon: A Study of the Closure of a Queensland Presbyterian Mission (Unpublished Honours thesis, University of Queensland; 1996) 18. Mapoon Aboriginal Shire Council, Mapoon History (2011) <http://www.mapoon.com/37.html> at 19 November 2012. Wharton identifies assistants to the missionaries as being from Vanuatu (New Hebrides) but indicates no official evidence that their recruitment is available in church records. See: Queensland, Report of the Chief Protector of Aboriginals for the year ended 1904 (1905) 17-18, which indicates that Mapoon South Sea Islander Peter Bee lived and worked in Mapoon and later went to Aurukun with Rev Hey to establish the Archer River Mission in 1904. Other South Sea Islanders from Mapoon are identified as Harry Louis and Harry Price. See: A Ward, The Miracle of Mapoon, or, from Native Camp to Christian Village (1908) 242. For information on the Tjungundji people and South Sea Islanders, see: G Wharton, The Day They Burned Mapoon, (Unpublished Honours thesis, University of Queensland; 1996) 15. Wharton, above n 3, 46-54. Queensland, Report of the Director of Native Affairs for the Twelve Months ended 30 June 1954, 1. The principles of a joint policy were agreed to at a conference between the Director of Native Affairs, the Reverend Sweet (Secretary of the AFMC) and the Reverend G L Filmer (the Mission Superintendent) on 7 September 1960. See G Wharton, The Day They Burned Mapoon, 18-19. Above n 3, 18; Report of the Director of Native Affairs for the Twelve Months ended 30 June 1962, 14, 20. Report of the Director of Native Affairs for the Twelve Months ended 30 June 1963 (1963), 15. The Queensland Police Service officers were Constable First Class Noel Hughes and Constable Jim O’Shea. The Islander police officers were Sergeant Waia, Constable Carlous Isua and possibly Phil Waigana. See: Queensland State Archives, Director of Native Affairs Office, Series SRS 505/1, Correspondence Files, Item 6D/25, Missions, Mapoon, Proposed Removal to New Site. Queensland State Archives, Director of Native Affairs Office, Series SRS 505/1, Correspondence Files, Item 9M/65, Administration, Bamaga, Transfer of Mapoon Residents to New Mapoon; Queensland State Archives, Director of Native Affairs Office, Series SRS 505/1, Correspondence Files, Item 6D/17, Missions, Mapoon, Administration and General. On 4.1.1964 six Mapoon families comprising 48 people arrived at Weipa aboard the Gelam. The last families to leave Mapoon were the Bonds, the Marks, Annette Reid, Roy Fletcher, Betty Fletcher, Henry Brown, Flora Bond and her daughter, who arrived at New Mapoon on 23.5.1964, See above n 3, 11. Mapoon Aboriginal Shire Council, Mapoon History (2011) <http://www.mapoon.com/37.html> at 8 November 2012. New Mapoon Aboriginal Council DOGIT covers 9, 390 hectares. For information regarding re-election of Community Councils, see Queensland, Annual Report of the Department of Community Services for 1986 (1987) 3. For information regarding granting of DOGIT lease to all communities in trust areas, see Queensland, Annual Report of the Department of Community Services for 1987 (1988) 28-29; New Mapoon DOGIT is described in the Northern Peninsula area Infrastructure ILUA as Lot 30 on Crown Plan S055, Country of Somerset, Parish of Cowal, title reference 21328059. 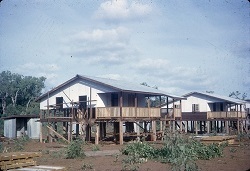 Newly constructed homes at New Mapoon, 1962. Image by James Richard Sweet, provided by John Oxley Library, State Library of Queensland Neg: 2804-0037-0005.